is a special event here in the north. 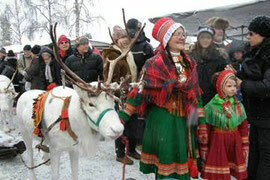 You can experience true Sami culture, handicraft ,good food and music there. Jokkmokk's Market 2013 takes place during february 7-9.. with all of its activities and cultural events including the big marketplace in the centre of Jokkmokk. to the Lapplands Drag huskyfarm. Upon the arrival you are shown to your cosy accomodation . Check out the place, unpack and make yourselves at home.. In the evening a welcome dinner with traditional Scandinavian food is waiting for you and we talk about the days ahead of us. Hearty breakfast in the morning. 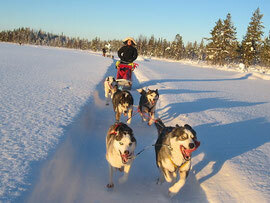 Then ´we´re off on our first sleddogtrip, a tour of about 2 hours through the surrounding forests. Swedish barbecue hut ( grillkåta ) or in the main house. Relax with a Sauna if you want. every guest prepares its team for the respective day tours. A Guide helps you if you want. and everyone learns the character of his dogs. Now you are surrounded by the unique Lapland silence. the sound of crackling snow under their paws. 25 and 45 km in distance. We will glide over frozen lakes and rivers and through deeply snow-covered forests. Upon return we will huddle together and feed the dogs. Altogether you will spend ca 8 hours of the day with our dogs. In the evening you can use the sauna,the warm bubblepool or simply spend the evening in your cosy cottage. We eat dinner together. Early in the morning we will start to Jokkmokk to visit the market. The following two days we will experiense the samisk evenemangs and their culture and we have the possibility to go shopping. out at a solitarily lain, beautiful lake. 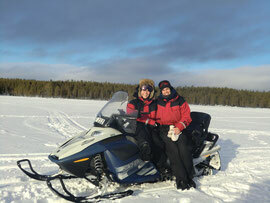 There we will have good time to icefishing and enjoy a outdoor lunch together. In the late afternoon we´ll return to the farm. On the 8th day ends the 8 days HUSKY & JOKKMOKK Tour/ variant 2. The 8th day is the departureday.We take our guests back to the airport in Arvidsjaur. 40 km trip with the dogs to a wilderness cabin. We will spent one night outside in the wilderness in a romantic cabin. Thge evening we will spens outside by the fire. Maybe we'll see polar lights on the horizon. The next day after breakfast we will drive home back to the farm. Unfortunately even the most beautiful experiences end. and we take you back to airport in Arvidsjaur. 10 days / 9 ights. Maximum 6 persons per tour.